Osteoporosis is a serious brittle bone disease that affects millions, and the UVA researchers identified more than a dozen genes amid the vast human genome likely responsible for bone density and strength. The new approach the researchers used to identify these genes could speed the development of new and better treatments for osteoporosis, as well as many other diseases. In charting the genome, scientists commonly rely on GWAS, as these studies identify locations within the genome where genes associated with a certain disease are thought to be located. The problem, though, is that GWAS alone doesn't tell them which genes are truly influencing a disease. Dr. Farber and his colleagues wanted to go beyond GWAS, so they identified genes that appeared to work together and then mapped those genes onto the locations identified by GWAS. By cross-referencing the two, they were able to predict 33 genes that they believe are responsible for controlling bone density. Eighteen of the genes had been shown previously to play a role, but the remaining 15 were new. 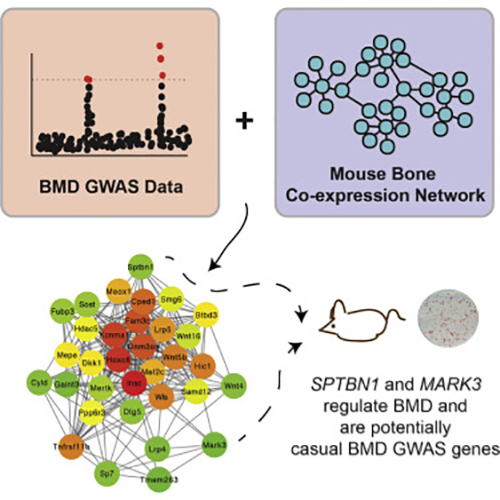 Since their initial findings, the researchers tested two of the previously unknown genes and confirmed that they contribute to controlling bone mineral density. The UVA team does not expect their predictions will have a 100 percent success rate, but they do feel the technique has great promise for helping accelerate the process of determining gene function. Moreover, by hastening the understanding of gene function, they can accelerate the process of developing new drugs to target those genes, in order to treat disease.